Are fall decorations and pumpkin spice lattes calling your name? 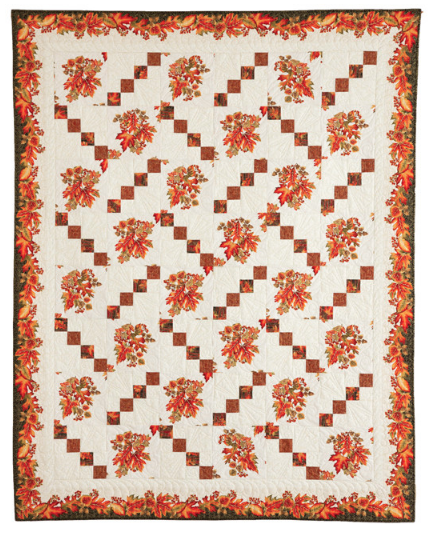 We have a cozy autumn quilt for you! Melanie Greseth and Joanie Holton of Tailormade by Design used Jackie Robinson's Autumn Leaves collection to create "Leaf Scatter," the Fons & Porter's Love of Quilting September/October 2018 cover quilt. 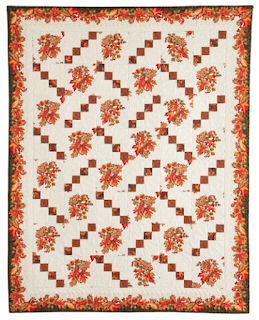 Why did you choose Jackie’s Autumn Leaves collection for this quilt? Both my sister and I love fall, and this is such a lovely and warm fall line. Plus, Jackie always creates such beautiful stripes that can be used as borders. Her lines have all the elements you need for a quilt—an allover print, blenders, and medium-size prints in different values. It makes it easy to design a quilt! We wanted it to be simple and approachable, but also highlight the beautiful fabrics. The design itself is pretty traditional—four-patches combined with a larger focal square. The large allover leaf print works beautifully in the focal squares. Any tips for making this quilt? It’s not difficult, but you do have to pay attention to direction as you’re sewing your blocks and then when you’re assembling the quilt. When you cut the focal blocks, I used a ruler close to the block size and cut out a “row” of blocks. Then I moved to a different section and cut out more. I used a little bit more yardage, but that way I didn’t have the exact same squares for each block. 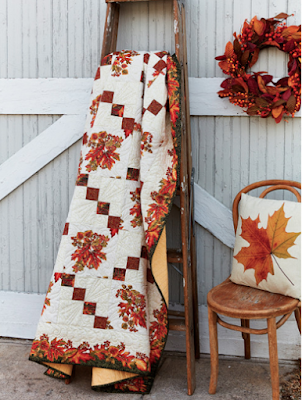 I love the cozy beautiful colors of fall, and the border print is fabulous! Click here to see the Autumn Leaves collection. Click here to purchase the kit for this quilt. 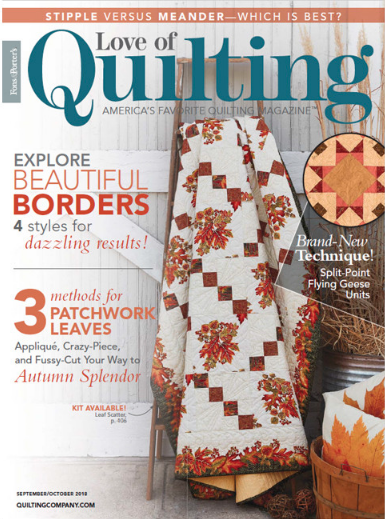 Click here to purchase Love of Quilting magazine.